Even though Batman’s rogues gallery is a horde of murderous lunatics, you always get the sense that Batman himself is never in any real danger from them. They’re fixated with him. They want him around. But what if Batman came face to face with a true hunter singularly obsessed with killing him? 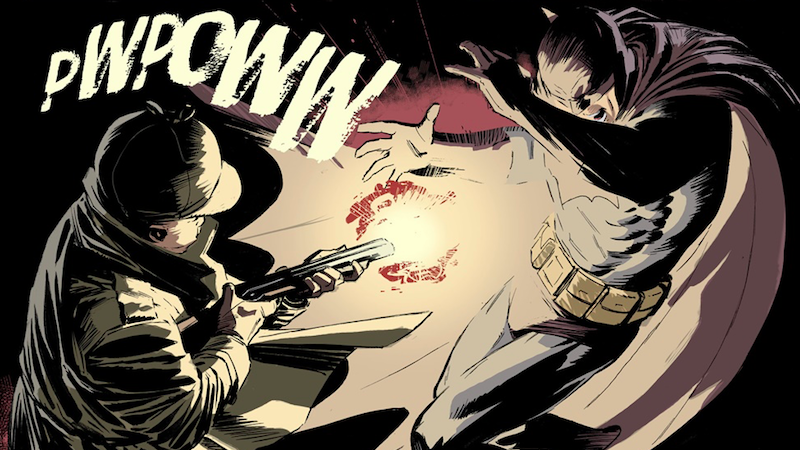 By framing DC’s Elmer Fudd/Batman special as a noir tale of passion and revenge, writer Tom King and illustrators Lee Weeks and Byron Vaughns get into the very essence of what makes the book’s titular characters so intriguing. Though they manifest it in different ways, both Elmer Fudd and Batman are cunning, obsessive, armed men who resort to violence to achieve their goals. Both have deep senses of right and wrong and while the core components that make them tick might read as dark and dangerous on paper, the two men are generally genuinely good people. Elmer Fudd/Batman treats the two characters as mirror images of one another, but in doing so, ultimately casts them both in a new kind of light that underscores different aspects of their personalities that we rarely see. In this world all of Warner Bros.’ Looney Tunes are reimagined as gritty, grimy human answers to their cartoon selves who all happen to live in Gotham City and frequent Porky’s bar. Here, Foghorn Leghorn is a smooth-talking card shark and Yosemite Sam is a mustachioed biker with a temper. Bugs is a bucktoothed gun for hire who likes his liquor with a side of carrots and Tweety is a bobble-headed Lothario with a filthy mouth. Though Elmer’s a Looney Tune, his transition into Gotham is the most seamless and satisfying. His physical transformation isn’t nearly as dramatic as that of the others, but his presence takes on a new gravity and darkness that’s still shot through with Elmer’s classic sweetness. In this Gotham, Elmer isn’t just a hunter. He’s a marksman and a killer and a man mourning the murder of the woman he loved. This Wabbit Hunting Season isn’t just for sport, it’s for vengeance against Bugs, who Elmer knows is responsible for his girlfriend’s death. When Elmer shows up at Porky’s to confront Bugs, there’s a palpable sense of dread on the page that you’d never really see in a Looney Tunes cartoon. Elmer has every intention of shooting Bugs at point blank range and there’s no indication that the encounter’s going to end in a joke or trick. Bugs knows that Elmer means to kill him in cold blood and the only way that he’s going to leave that bar alive is by offering the hunter something he can’t refuse—the identity of the person who ordered the hit on Elmer’s lover. As a reader, it isn’t immediately clear why Bruce Wayne would hire a two-bit hitman like Bugs Bunny. To Elmer, though, the answer is obvious, because he and Bruce have history with one another. The woman that Elmer loved once rejected him in favor of Bruce before ultimately leaving Bruce for Elmer. After ambushing Bruce Wayne at a party, Elmer attempts to flee Gotham, and naturally, Batman is soon on Elmer’s tail investigating the attack. It’s here that Elmer Fudd/Batman stops just being a moody noir of a comic for a second and becomes something surreal and viscerally satisfying. Byron Vaughns and Lee Weeks’ action sequences between Batman and Elmer Fudd are a dark, fluid mix of Looney Tunes’ signature slapstick and classic Batman shadowy hand to hand combat. When Batman steps out to attack Elmer Fudd from behind, Fudd draws his shotgun with a terrifying quickness that catches Batman off guard. Few people have managed to shoot Batman squarely in the chest and yet, right there in the middle of the book, there’s Elmer Fudd emptying two barrels with a dead look in his eyes. The two are evenly matched and poised to fight each another to the death... that is, until they realize that something about their shared lovers’ death doesn’t quite add up. As is often the case with crimes in Gotham, the triggering event at the center of Elmer Fudd/Batman isn’t quite what it seems, and the pitch perfect twist at the end ties the book’s plot into a lovely, deep noir bow. All of DC and Warner Bros.’ specials have been solid crossovers that make the initially odd-seeming gimmick seem brilliant in retrospect, but King, Weeks, and Vaughns take things a little further. Elmer Fudd/Batman doesn’t just feel like a clever crossover; it feels a universe that was meant to be. If DC’s considering turning any of these books into full on series, they should start with this one.